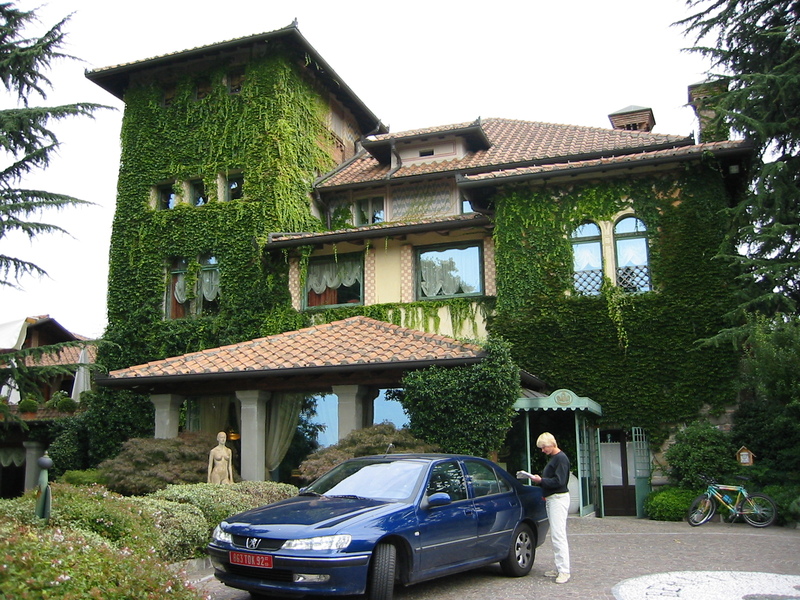 We stayed at the Hotel L’Albereta a few years ago; one of those comfortable, quiet, small luxury hotels in the midst of the Prosecco vineyards of the Italian Lake District. We loved the quiet comfort of the rooms, although it took about 20 minutes with the instruction card to figure out how to use the computerized shower. I actually had to take a shower with the instruction manual. 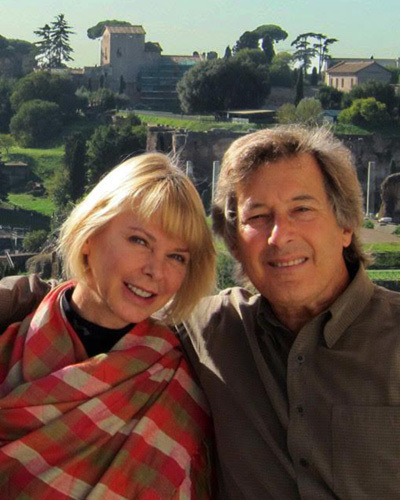 We enjoyed the walks through the sculpture gardens in and around the property and Gretchen hit the spa, but the main attraction at L’Albereta is the Restaurant Gaultiero Marchesi. This is one of best restaurants we have ever had the pleasure to enjoy. We thought so three years ago when we first discovered it and we haven’t changed our opinion after this last visit. From the 24 carat gold leaf that sat atop of the creamy risotto, to the unusual chunky gazpacho with melanzane puree to the tender coniglio (rabbit) salad, to the veal medallions topped with foie gras and simmering in a most amazing sauce to the fruit soufflés and the most impeccable service. Sure, it is expensive, but every so often we like to really enjoy an amazing meal. Through our 2 days there, we became very friendly with the staff and they even invited us to the kitchen and meet the cooks. Nicola, the sommelier (voted the best in Italy) gave us a brief course on Italian wine appreciation. We were so impressed with all of it. At some point during our conversations, Nicola learned we were from San Francisco and quickly ran off, returning a few moments later with a plaque bestowed to Gaultiero Marchesi by San Francisco mayor Willy Brown designating him the “Best Chef in all of Italy”. We laughed when we saw that one and tried to imagine the circumstance that lead “Hizhonor” to bestow the award. The tunnel under Mont Blanc (or Monte Bianco from the Italian side) is over 7 miles long. It’s an astonishing feat of engineering, and for 25 euros we got to drive through it. However, the view of the mountains from the other side was incredible. Shirtsleeves and shorts on us below, snow on the mountains up on top. 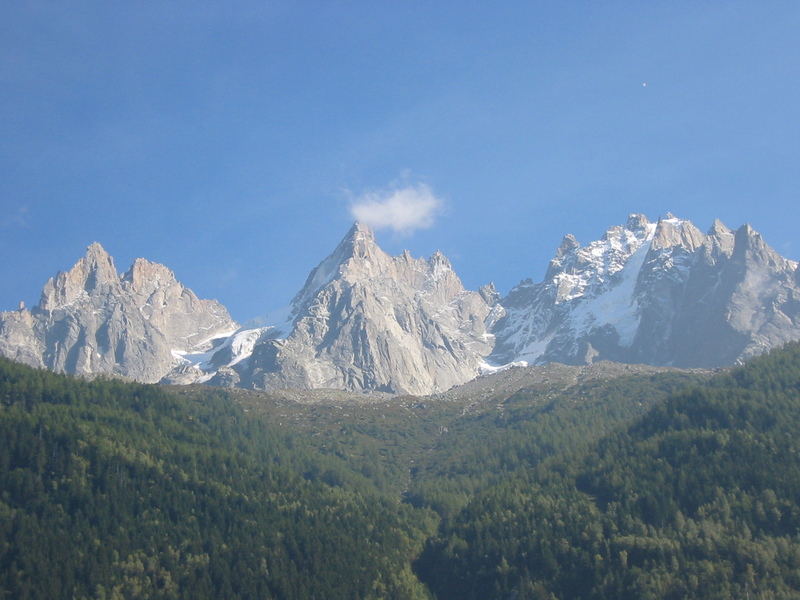 Chamonix is a typical tourist destination with more than enough sporting goods shops, cafes, restaurants and hotels and a staggering presence of Mont Blanc and her mountain friends all around you. Parasailers glide off the mountain peaks like large colorful birds as people below drink coffee and beer at the outdoor cafes and bars of the main square. Although we had booked a table at the restaurant of our hotel (another of the fine dining experiences of Europe) we were so full of “fine dining”, we decided to hoof it into the village and grab a brasserie meal instead. It was cheap and really bad. And so it goes. The next morning we took a walk into the main square, had a few cups of coffee, watched the parasailers, packed up the car and headed to France.